There is no doubt that plywood is a highly versatile and ubiquitous wood product that is usually available in varying forms. This makes it an ideal product for a broad range of uses. Plywood merchants argue that plywood was the first wood-engineered product and it continues to live to its expectation. Plywood is usually produced by sticking thin and light sheets of wood together such that the grain of each thin sheet lies at opposing angles referred to as cross-branding. The primary purpose of cross-branding is to enhance the overall strength, durability, and stability of the wood product. The earliest form of plywood was spotted in ancient Egypt around 3000BC when wooden products were manufactured from a wide range of sewn veneers that were glued together in an unusual crosswise pattern. Plywood is usually manufactured from various softwood species such as pine, Spruce, and Douglas fir. Various treatments are applied to plywood to improve its physical appearance and characteristics such as fire resistance, durability, and abrasion resistance. When it comes to using plywood in the construction industry the updated standard for all wood-based panels and joinery, EN 13986, stipulates that both internal and external use plywood must adhere to any of the three performance classes within the EN636 standard. Plywood merchants and suppliers must provide evidence to prove that their products adhere to the specified standards. For instance, if you previously supplied weather-proof or exterior quality wood for use in the construction sector, you must specify that it complies with EN636, Class 3 standard. This refers to top plywood that is specifically for internal applications with minimum exposure to moisture. Applicable standards for this type of plywood include the EN636 Class 1, EN 314-2 Class 1 that defines plywood quality, EN 310 for bending test, and the EN 13986 for all wood-based panels used in construction. 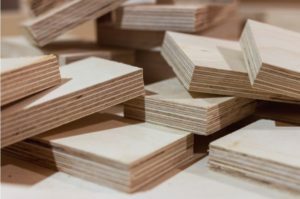 Plywood for use in dry conditions is ideal for all internal joinery, pipe boxing, doors, flooring underlay, and a wide range of weight saving applications. The EN 636-2 standard applies to plywood that is to be used in humid conditions characterised by relatively high moisture content and a temperature of below 20oC. The surrounding relative humidity must exceed 85% for a few months in a year. This type of plywood is suitable for internal use to construct floors, walls, linings, roof decking, and even flooring underlay. The other applicable standards include the EN 13986 for wood-based panels, EN 335 for durability and the EN 314-2 for plywood quality. The plywood for exterior use standards defines plywood to be used in specific climatic conditions that lead to extremely higher moisture content and other exterior climatic conditions. Such plywood can be used for both internal and external joinery which can be subjected to long term exposure to wetting and extreme heat. The applicable standards include the EN 636 Class 3, EN 335, EN 310, and the EN 13986.